In 1990, a holiday to Argentina would change the lives of the Bousquet family forever. When Jean Bousquet laid his eyes on the Gualtallary Valley – a remote and arid terrain high in the Tupungato district of the Uco Valley in the country’s Mendoza region – he knew he’d found the location he’d been dreaming of. Here, where the condors circle above and the Andes Mountains stand imposingly in the distance, Jean had discovered his ideal terroir; a perfect place in which to nurture organically grown wines. Although the location had a lot of potential, the only way to exploit it was through hard work and determination. Undeterred by such challenges, the family patriarch returned to France and, between visits to Argentina, set about divesting himself of virtually everything he owned, including the family winery and vineyards in Pennautier, near Carcassonne in the south-west of France. Industry experts in both France and Argentina questioned the decision, but almost 30 years after that fateful family trip, Jean’s risks have certainly paid off. Today, the future of the Domaine Bousquet winery rests with his son Guillaume, daughter Anne and her husband, Labid al Ameri. 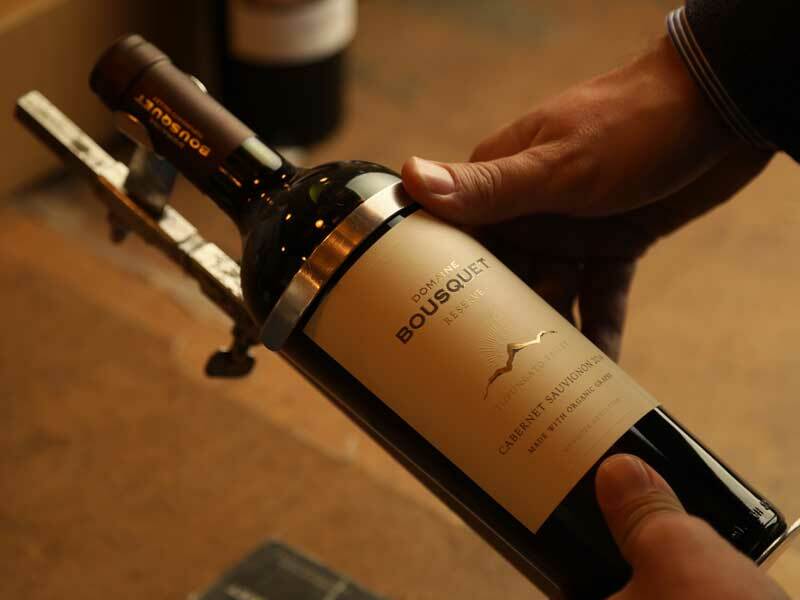 Following a 2001 trip to Argentina, Anne and Labid began investing in Domaine Bousquet, after a devaluation of the Argentine currency had rendered land prices cheap and Argentine exports very competitive. By 2008, both Labid and Anne had joined the winery full-time, eventually taking full leadership in 2011. In an interview with World Finance, Anne explained how Domaine Bousquet has managed to stand out in an incredibly crowded market. With altitudes ranging up to 5,249ft, Gualtallary occupies the highest extremes of Mendoza’s viticultural limits. Today, wine cognoscenti recognise it as the source of some of Mendoza’s finest wines, but the same could not be said when the Bousquet family first set eyes on this cool-climate locale. Back then, it was virgin territory: tracts of semi-desert, nothing planted, no water above ground, no electricity and a single dirt track by way of access. Locals dismissed the area as too cold for growing grapes. Anne’s father was not the first, nor the only wine producer to have his interest piqued by the Gualtallary Valley. But what set him apart is that he succeeded where several better financed, well-known names did not. What he seized upon, but others failed to grasp, was the singular importance of water. Water is hard to come by in Gualtallary; technically, the area is a desert. However, the family had done its homework and its first task in 1998 was to dig a well – all 495ft of it. Two years in the making, its completion was followed by the planting of vines. Other investors in the region, meanwhile, watched their hopes fade, chiefly due to an inability to extract water or secure water rights. Mastery of the natural landscape alone was not enough to turn an arid desert into an award-winning vineyard. Personal relationships have played just as important a role in the success of Domaine Bousquet, particularly in its early days. The complementary skill sets possessed by Anne and her husband, for example, helped take the vineyard’s success to another level. Broader community partnerships have also played a vital role in Domaine Bousquet’s success. Around 95 percent of employees come from the local town of Tupungato, 10km from the winery, and as a rural company, Domaine Bousquet’s partnerships with neighbouring vineyards have proven vital. Improvements to surrounding roads have bolstered access to markets, provided good local jobs and encouraged staff to achieve way beyond their expectations. Domaine Bousquet also trains and promotes from within. Executive Chef Adrian Baggio, for example, was sent as an intern to New York, before rising through the ranks to take charge of the winery’s Gaia Restaurant. What’s more, all the harvest pickers are from Tupungato. The Bousquet family has been involved in winemaking for four generations, but this can only continue if they value sustainability over short-term success. With this in mind, Domaine Bousquet has made great efforts to pursue organic practices, a reduced carbon footprint and growth in the local community. Domaine Bousquet also made staff training a priority by creating development programmes that focus on a wide range of skills, from wine growing to office work. Every detail had to be considered, from transport for employees who don’t own a car, to microloans for continuing education. The wine industry as a whole has transformed the Tupungato economy, but Domaine Bousquet was there first. Another major strand of the company’s sustainable ethos is its commitment to organic farming. Crops are grown in harmony with nature without using any chemicals, including pesticides, herbicides or synthetic fertilisers. Instead, natural fertilisers, such as Domaine Bousquet’s own compost, are used. Water shortages are averted through investment in water treatment facilities to limit waste. In addition, all vineyards use drip irrigation, and the winery is equipped with automatic cut-off cleaners to further reduce water consumption. Anne and the other members of staff at Domaine Bousquet believe that the healthier the vineyard, the better the fruit and, of course, the wine. In other words, by nourishing the land and treating it with respect, the land will give back its best produce. But the company also likes to think more broadly in terms of sustainability. It has a capability programme for all its employees and subsequently decided to invest in achieving Fair for Life certification. In addition, by choosing to only use lightweight glass bottles across its entire wine portfolio, Domaine Bousquet has significantly reduced its carbon footprint. Winemaking is a millenary industry that seemed as though it would never change. However, consumer needs are evolving rapidly, particularly with regard to what we eat and drink. Consumers today are increasingly conscious about how each product is made and respect brands that care about natural and sustainable processes. Just as consumers are changing, so too must the wine industry. Domaine Bousquet is well aware of this and continues to focus on making high-quality wines that support the local community and bring pleasure to its global customer base. As long as the company continues on this path, it will surely achieve its goal of becoming the number one organic winery in the world.